Bowl of noodles anyone? Just kidding. 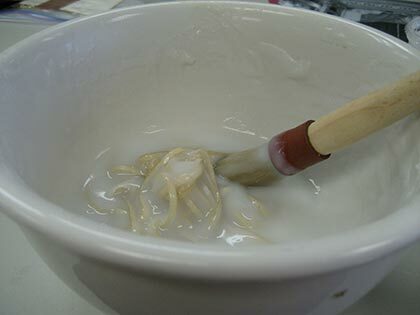 That’s my bowl of vellum strips soaking up wheatpaste. This afternoon I didn’t work on my springback book because I wanted to get ahead in a new binding technique I’m learning which will hopefully result in a large journal to be used as a photo album. The vellum strips will be used in the binding to give it a bit more flair. Why soak them in wheatpaste? Vellum is hard so I want the strips to soften up so I can sew them through the spine and be a part of the binding. This will be a short post tonight because I need to go rest my arms – I couldn’t even make it to yoga tonight. I had to make 10 cutouts in the spine of the book, where the thread and vellum strips will go through, and this was particularly hard to do because I’m also using vellum on the spine. The spine is thick cardboard reinforced with vellum so it’s quite sturdy. Seriously, I could barely straighten my arms after holding on to scalpel and ruler while I made those precise cuts. I’m such a weakling I’d probably never be able to do that. Well done you! I’m fascinated! I have been looking for classes on this but have yet to find any in my area. Then again, I might have enough hobbies. Looking forward to seeing more. Mmmm, vellum and wheatpaste. My arms ache just hearing about the cutouts. I, for one, am starting to have an even deeper appreciation for handmade books. I just signed up for two classes and they actually have a few on book arts. I am so impressed by your efforts! How cool to work with vellum! You are so determined in your new craft. I admire you. Melody – It really can be. Sometimes my fingers hurt from sewing, other times my hands feel dry from all the washing off of glue, etc. But it’s such a rewarding hobby! Care – I hope you find some! I have a couple of other hobbies but those have really taken a backseat to bookbinding. The more I’ve gotten into it, the more I want to spend time learning and practicing. Stefanie – I always thought vellum was thin but that’s architectural vellum. The real thing is tough. I guess that’s why it can last for centuries! Christine – It’s amazing how a simple little book can have so much work going into it. My teacher has some wonderful books he’s shown me and I just want to learn more and more! Wow! This so so neat. I’d love to watch you doing this – honestly – very interesting! How hilarious, I really did think it was a bowl of noodles at first. I do hope you post some pics of the books you are making. 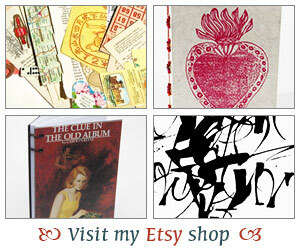 I love your interest in bookbinding! A truly important art– I love some of your previous accomplishments.